Today we received another 4-6 inches of snow. What better thing to do on a Sunday than PLAY IN IT! Jen and Zach decided to go on the back deck and clear off the snow with our shovels. 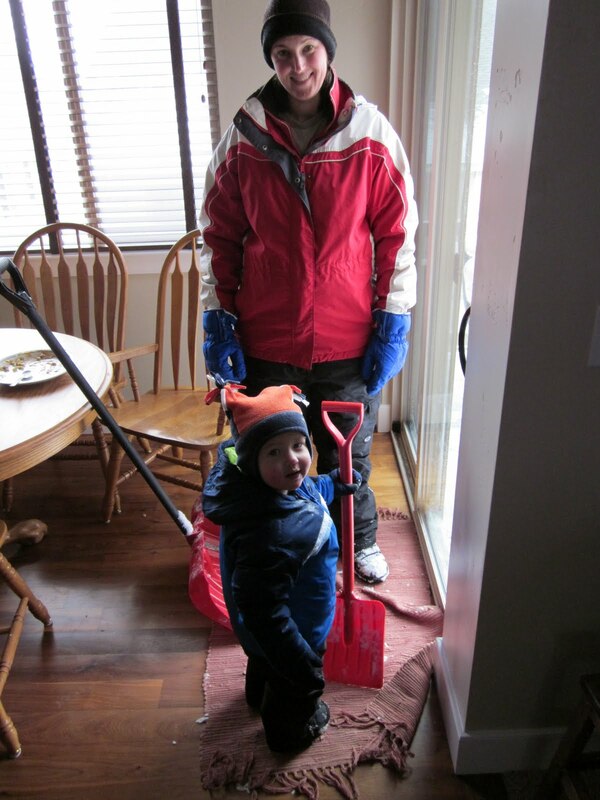 Mission accomplished - snow cleared off the back deck and play time for Zach! ...time for some hot chocolate! We also found this giant stocking that was given to us at the hospital last year when Logan was born. 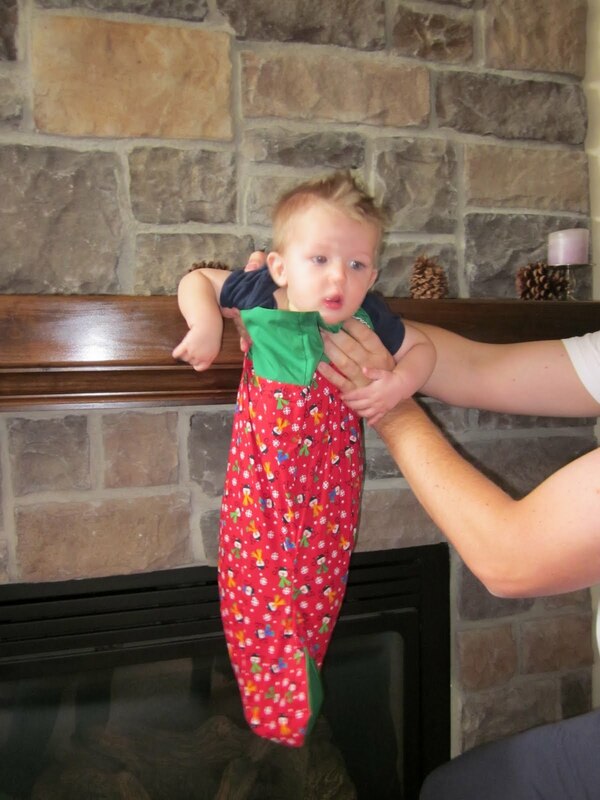 Logan fits in the stocking NOW....eleven months later! 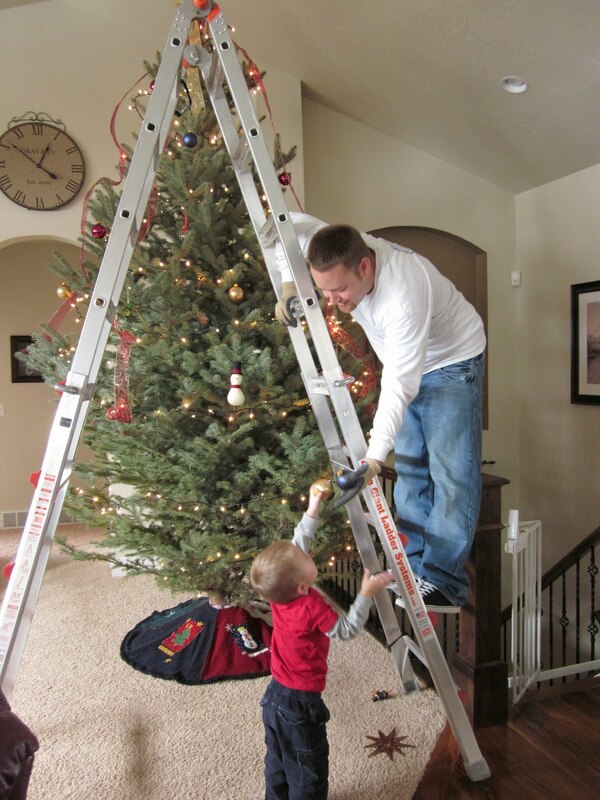 ...and now for the tree! 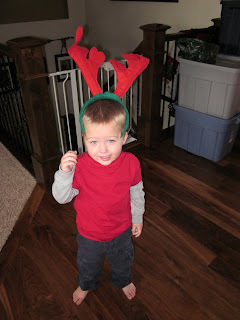 Zach was our big helper this year. He handed Dustin every single ornament that went on the tree. It was killing him that he couldn't go on the ladder with his father. This was our new ornament for this year....we had it made at Apple Hill when we were in California in November. 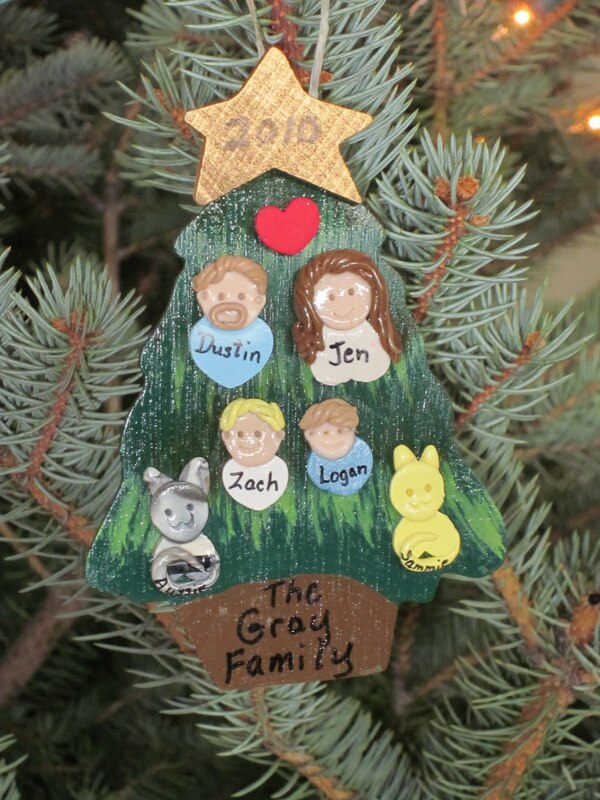 This was our finished product on the Christmas tree. Logan is 11 months old! Yup - that handsome fellow is Logan Alden Gray! He is eleven months old today. Logan continues to be very active and has decided this month he no longer wants "baby" food...he wants what everyone else is eating! He also has decided he no longer wants to be in his infant car seat carrier...so we will most likely be switching him to the next size up this upcoming week - we can no longer handle the screaming tantrum that occurs every time we leave our house. Logan can stand and balance himself without holding on to anything for about five seconds. Zach and Logan have started to become quite good pals and play with each other all the time (when Zach is in his "nice" mood of course). Logan also has his bottom two front teeth...and it looks like the top two front teeth will be making an appearance shortly. Today is the day! 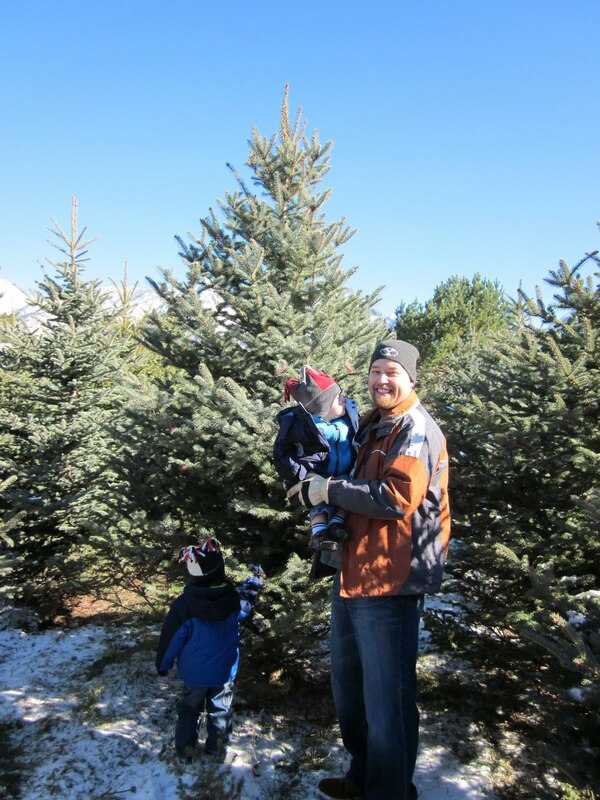 It is our family tradition to go find and cut down our Christmas tree the day after Thanksgiving (barring any seizures, blizzards, or vacations). 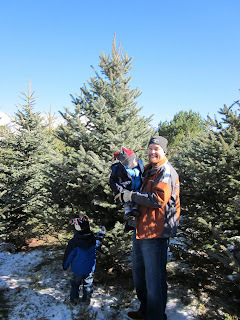 Last year we found a tree farm MUCH closer to our home - only a 10 minute drive. The weather was clear but a bit chilly. 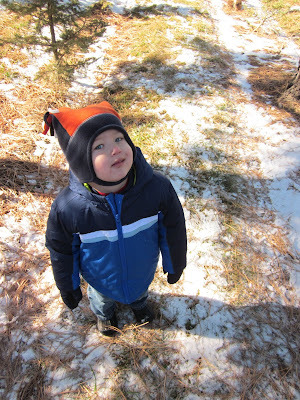 We bundled the kids up in the warm snow gear and started the hunt! 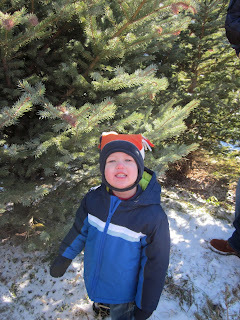 Logan was tired and was ready for a nap...Zach on the other hand had so much fun running around the trees with a bit of snow on the ground. Every tree we went to that was a potential candidate we would ask Zach if this was our Christmas tree, he kept replying, "no - we need a BIG tree". After about 15 minutes we found that "BIG" tree. This picture doesn't do it justice...it was at least 12 feet tall. Then Zach and Dustin dragged that big 12 footer to the clearing so the tree farm owners could haul it to our truck on a 4x4. At this point Logan was fast asleep in Jen's arms....he missed the "fun" part! The tree fit on top of the 4runner no problem. Now getting that sucker into the house...that is a different story. 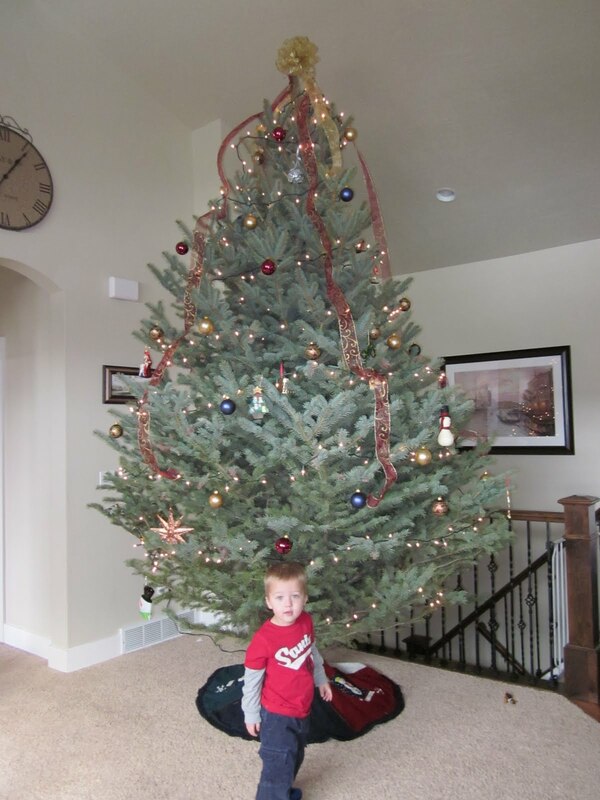 We have had a few years of trying to get large Christmas trees into our home....this year was probably the easiest (we learn from past mistakes!). 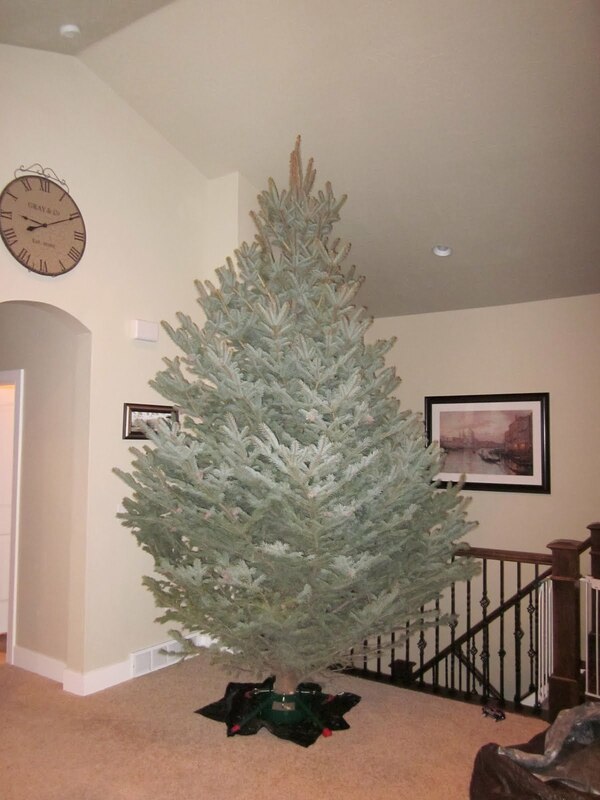 We had the tree in the garage. Dustin put the tree stand on the tree while it was in the garage and then wrapped and tied it with a large tarp. 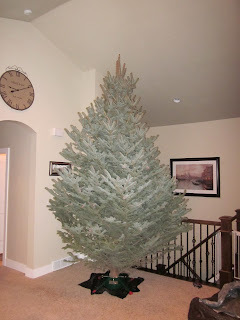 We then carried/dragged the tree from the garage through our front door. The tarp kept the tree and our front door frame protected from damage. 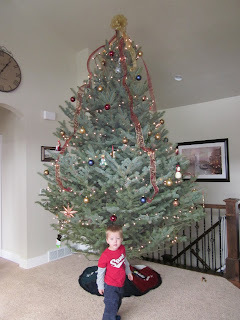 Once the tarp was removed we stood the tree up and made some minor adjustments to the position in the stand and TA-DA! 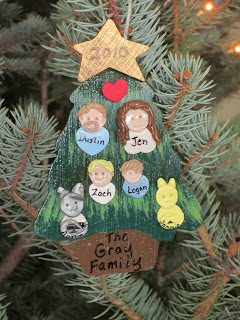 The Gray family 2010 Christmas tree! This year we had our yummy Thanksgiving dinner with the Krotosky's. We split up the menu and gathered at our house for the feast. 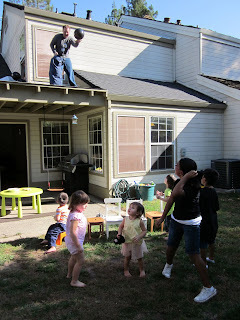 I didn't get any pictures :( It was a lovely day - we spent it with the kids, playing games ALL DAY LONG! Today we woke up to four inches of fresh powder snow! 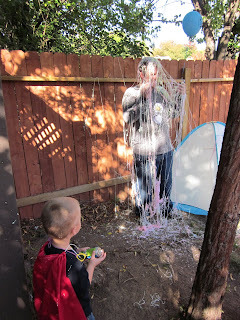 We played hooky from everything and decided to go play in it! 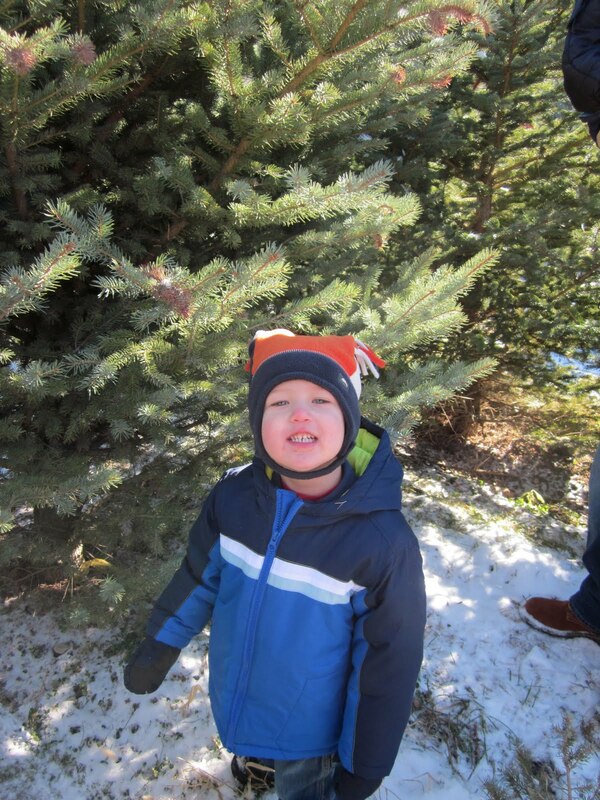 This was Logan's first "snow" experience. At first he wasn't sure he liked it.....but then as he saw all of us having fun he started to get more into it. Dustin playing with Zach....lots of snowball fights this morning! 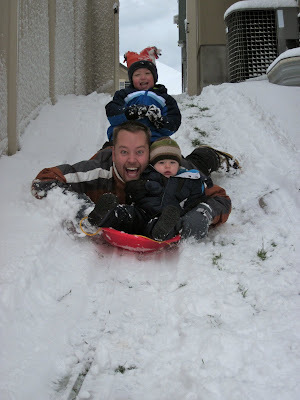 And we found out we can put THREE people on our sled! Zach, Dustin and Logan....check out the faces on this one as they were sledding down the side of our yard. We were finally able to get that smile out of Logan! And snowballs CAN taste oh so good! I wanna go in the Hummer! At the shop where Dustin is restoring his Dad's truck they have a stretched hummer.. Zach thinks its awesome. Here is the '58 sitting next to the hummer a few weeks ago..
Today Zach got a chance to see the hummer up close! He sat in the front of the truck and said things like, "Vroom Vroom", and "My Hummer!" Then he said "Close the door!" So we did, and he loved it. All he needed was a chauffeur cap and he was ready to drive that limo out of the garage! It was fun until we heard.. "click click!" Jen says.. "Dustin! Zach just locked the door!" Dustin said "He'll be fine. Zach. Unlock the door." Zach replied with a smile "No!" 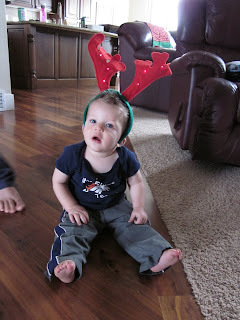 Then we watched him figure out how to make the electric seat slide forward and backward and all of the cool lights in the limo turning on and off.. Stinker. Lucky for us Joe didn't have the key in the ignition, because as you can see from this picture, there is no way to crawl from the back of the limo up front because there is a wall there! Today was Zach's first visit to the dentist! Dustin already had a scheduled cleaning and we were able to get Zach in at the same time. We figured if we had Zach watch Dustin getting his teeth cleaned maybe it would go better. We even were seated in the "monkey room" and had the movie Shrek playing in the ceiling. Zach was VERY interested in his dad's teeth and mouth. 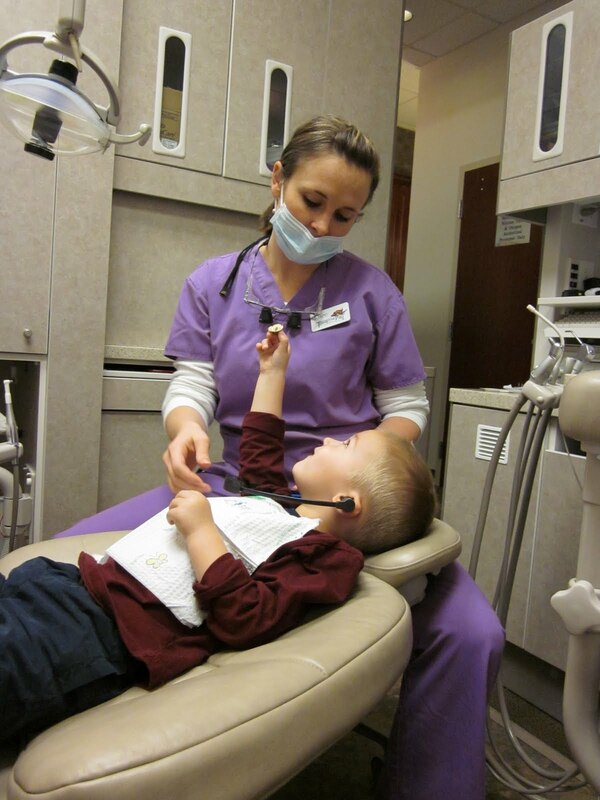 He insisted on helping out the hygienist the whole time. ...and he refused to open his mouth and started crying. The whole trip had been going so well. 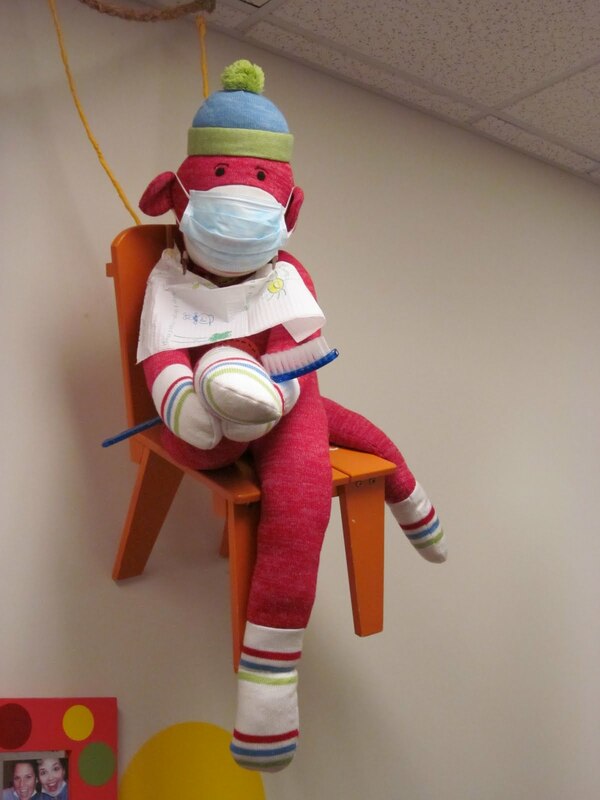 So that was the end of the dentist trip. They don't force the kids to do stuff at the first visit, they don't want to make it traumatic for them. They seemed to think that in 6 months he would have no issues getting his teeth cleaned....I guess we will see! ....beats the mom that showed up with goldfish....hands DOWN! Zach helped Jen bake the cookies. Zach was telling everyone about his "turkey cookies" all day! Logan's bottom two teeth came in!! 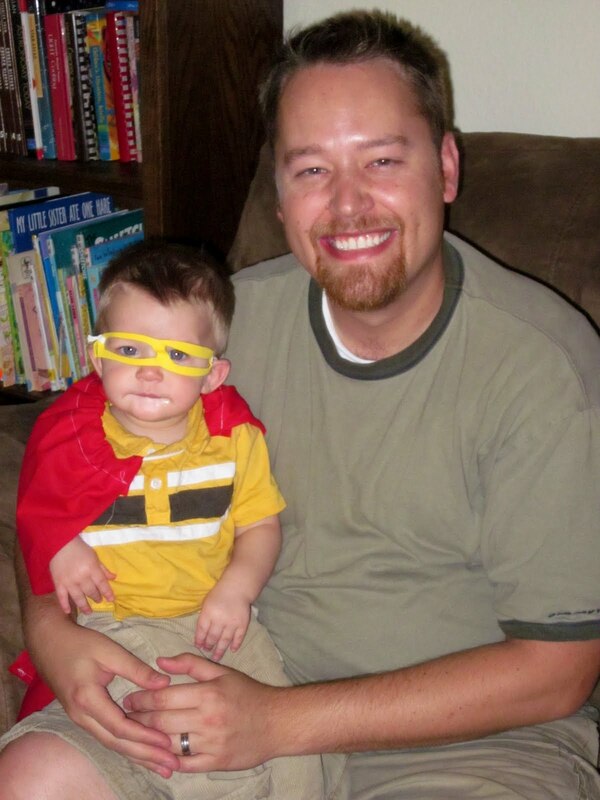 While we were in California - our nephew Scott had his 4 year old birthday party. 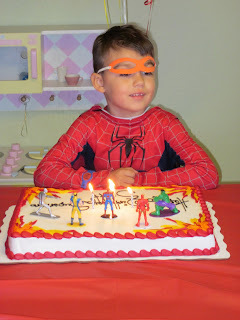 The theme of the party was "superheroes". Jen's sister-in-law Renee did a GREAT job hosting this party and keeping all the kids entertained! There was a "villain" (which was Jen's brother in disguise) that kept making appearances and the kids would have to do tasks to defeat the "villain" to gain more superhero powers! At end of all the superhero training the kids had earned all the gear - cape, glasses, and power bracelet! Logan flying - that superhero cape is a magical thing! My favorite shot of the day.....Logan looks so stinking cute! This is the cake Jen and her mom put together for the party. Sam's club did the flames for us and we got a bunch of Marvel superheroes to put on top. It turned out pretty good! At the end of the party all the kids were playing outside and Zach was pushed down from behind.....since he didn't see it coming he landed face first on the cement patio. He had some scrapes on his face - the only thing that put him in a good mood after that was this cat. It was a four month old cat of Scott's. Zach loved that he could pick it up and hug it and kiss it and it wouldn't run away (it was too young to realize it COULD run away!). 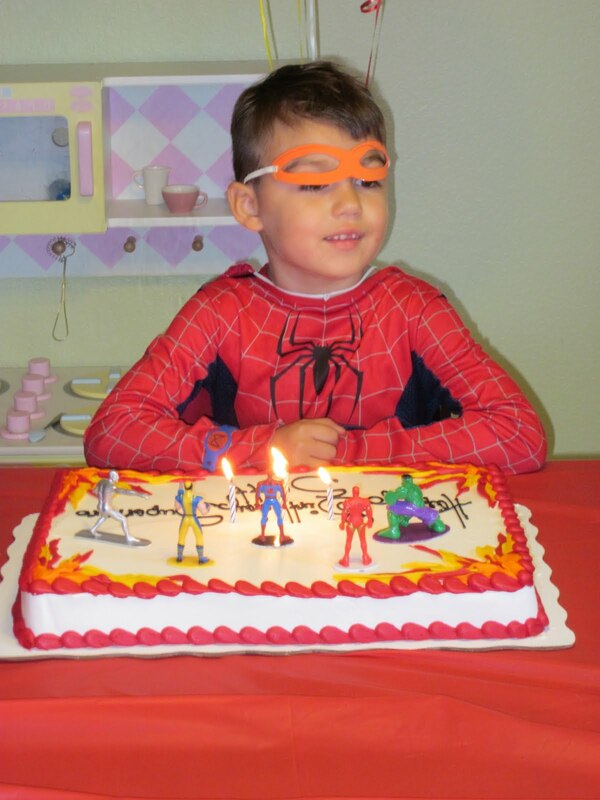 We had a great time at Scott's birthday party.....we have a bunch of superheroes on our hands now!